This weekend I had my metric century ride up in Sonoma. It was one of those things where you ride for 10 miles gawking at the scenery and then stop for some food – maybe a 1/2 a banana and some M&Ms; and then you ride for another 15 miles picking out your favorite house and marveling on the splendor and beauty of life and then you stop for lunch where they custom make a sandwich for you and you can have cookies and pretzels and chips and fill up the bottles and then you go for another 10 or 12 miles and stop for another snack and then you do the last part which, of course, has the hardest hill but then you get to head downhill and go to a BBQ. Can you spell g-l-o-r-i-o-u-s?? It’s the sort of thing where if you aren’t careful you can gain a couple pounds by the time you finish. Here’s the elevation map which makes it look way harder than it was. I don’t even remember that first hill but the second one is called Chalk Hill and takes some energy to get up, particularly when you’ve got 50 miles on your legs. I got up it, just fine, though even passing some people and leaving my friend Cindy in the dust and that’s a first, for sure. I highly recommend you click here and get the map of this ride and then make a point of doing it yourself sometime – probably without all the support and food. This ride was super fun for several other reasons, as well. 1). At check in we bumped into a woman we swim with who was thrilled to have some riding partners. I was pretty impressed with the pace she was setting and then, after the first stop she met up with the guys she rides with from Berkeley and I learned just how much she had been holding back. Once she hooked on with them she was gone like a shot. 2). At lunch I bumped into a friend from college I’ve been meaning to call. She is an avid rider and I’ve been thinking of calling her to go for a ride together. No excuses now! 3). Riding is a lot easier when you are lighter. As Greyhound pointed out I’ve improved my weight to power ratio and I really felt it. 4). It’s great to have some strategy for hill climbing. Thank you Monica! I was pretty awesome on those hills. 5). This was a ride, not a race and my average speed which was diluted by rest stops and slowing down in some spots to wait for my friend was 14.8 mph. That compares rather favorably to last years 11-ish. In fact, I did this 62 miles in 4:09 compared to last year’s Wildflower 25 mile ride in 2:06. 7). I had 90 minutes of running on the schedule for Sunday and I whined about it all day thinking it would be awful. It was not – it was a great run and I averaged 10:40 mph which is great for me on any 8 mile run and especially good when I’ve had a long ride the day before. 8). I’m glad I got the sight-seeing out of the way so I can bust a move at Vineman. Jenny wants to do it together which means I’m going to have step it up quite a bit because that woman is a smokin’ fast triathlating ma-sheen! 9). There are no cars on the back roads of the wine country between 7:30 AM and 10:00 AM and then there aren’t many before noon. Bliss! 10). My first triathlon is Saturday – I’m feeling a PR coming on. This entry was posted in Cycling, Monday Monday. Bookmark the permalink. You are getting better and better all the time 🙂 I also see a PR in your future! Whoa…how friggen beautiful is that??? that is a GREAT ride! i love all the yummy stops. if only they’d toss in a night at a bed and breakfast, i’d be SO THERE! Hey girlfriend-I am doing Vineman!!Woo-woo! I did Barb’s race a few years ago as my first half IM and the course is be-utiful!! Wow. Your pix on your post look similar to Bolder’s this week. What a beautiful ride! Great job on the speed and hill climbing. Sounds like a fun event. I would like to come out and spectate/volunteer at the 70.3 next month but not sure if I can. It would be nice to see the area since I”m doing the Barb’s Race. What race are you doing this weekend? Maybe I can come watch. I love reading stories like this! Good luck Saturday at your Triathlon!! Alright! I can’t wait to read the race report for your race! 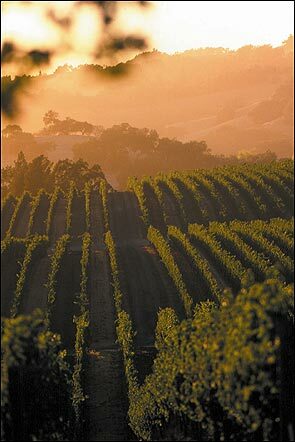 Riding through wine country sounds amazing. I would love to be doing that, someday. I am confused. Where’s the wine in the wine country century =D?